Supra Boats @Supra_Boats is being recognized for outstanding customer service again this year with the 2012 Marine Industry CSI Award from NMMA. The National Marine Manufacturers Association (NMMA) announced Supra Boats as a recipient of the 2012 Marine Industry CSI Award. That makes it 7 years in a row for this luxury performance wake boat brand. Supra Boats was recognized individually for excellence in customer satisfaction, as part of NMMA’s Customer Satisfaction Index (CSI) program. Supra Boats will be acknowledged during the annual Industry Breakfast at the 2012 International Boat Builders’ Exhibition and Conference (IBEX) in Louisville, Kentucky. 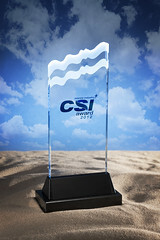 The Marine Industry CSI Awards program honors participating manufacturers that actively measure customer satisfaction and pursue continuous improvement to better serve the customer. Award recipients achieved and maintained an independently-measured standard of excellence of 90 percent or higher in customer satisfaction over the past year, based on information provided by customers purchasing a new boat or engine during the period between April 1, 2011 and March 31, 2012. Participating manufacturers must survey all new boat buyers during this period. For this reporting period, the program surveyed more than 32,000 consumers. You can learn more about the Supra Boats team who makes the company's customer service "beyond better" in this article, "Beyond Better Built: Customer Service"
The exclusive power plant for Supra Boats, Indmar Marine Engines, earned this coveted customer service award in the engine manufacturer segment as well. NMMA launched its CSI program in 2001 to provide boat and engine manufacturers with an independently measured, cost-effective means of improving customer satisfaction in the boating industry. Since the program’s inception, more than 600,000 surveys have been sent out to new boat and engine customers, allowing participating manufacturers to monitor customer satisfaction on an ongoing basis, and to benchmark themselves against the industry and their competitors. About Marine Industry CSI: The Marine Industry CSI program meets the CSI requirements of the NMMA Boat/Yacht Certification program. For manufacturers that are full participants in the Marine Industry CSI process, the included reporting also fills the dealer level CSI requirements of the Marine Industry Dealership Certification program. For more information on CSI Award recipients, or to get involved with the CSI program, contact Terry Leitz at tleitz@nmma.org or visit www.nmma.org. About NMMA: National Marine Manufacturers Association (NMMA) is the leading association representing the recreational boating industry in North America. NMMA member companies produce more than 80 percent of the boats, engines, trailers, accessories and gear used by boaters and anglers throughout the U.S. and Canada. The association is dedicated to industry growth through programs in public policy advocacy, market statistics and research, product quality assurance and promotion of the boating lifestyle.